There are many reasons why people move to Charlotte, NC. 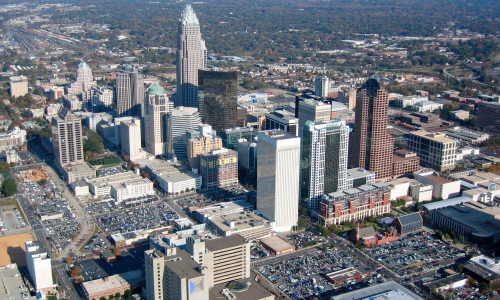 Charlotte is an American city located in Mecklenburg County, and it’s the largest one in the state of North Carolina. It is considered an important financial and commercial center since two of the biggest banks in the country are here, Wachovia Bank and Bank of America. It is also the headquarters of NASCAR Hall of Fame which celebrates auto racing with movies and interactive exhibits. It is known as “The Queen City” and with 842.051 inhabitants it is the most populated city in North Carolina. For those who wish to move and are looking to renovate themselves in a new environment, Charlotte, NC is the best choice. It is the best city to live in the United States. Affordable housing and multiple options to look for promising businesses are found here. It has a solid and stable economy according to Relocate America, Home Route real estate agency’s service of information and resources. For these and many other reasons, we want to share with you today 8 reasons why people are moving to Charlotte, and search for it as the best destination to live. Charlotte is the largest city in North Carolina and is a prominent financial center in the country. Thus, there exist job opportunities, high salaries and houses are affordable which makes it an attractive place to live. Education is a central subject; Charlotte has outstanding schools and universities, different places for leisure and a pleasant humid subtropical climate. It is also surrounded by natural and artificial lakes, hills where you can camp with your family without getting too far from home. The cost of living in Charlotte is below the index of what is considered high in the United States. Its economy is prosperous which has undoubtedly contributed to its great population growth since many people want to live in Charlotte. This is a city in full development that offers comfort and safety. The State of North Carolina has the highest flat income index, unlike the other 8 states that also have this tax system. The job market is wide and promising. Regarding the employment rate, Charlotte is at number 5 on the Forbes list with the best cities to work in the United States. Charlotte has excellent medical facilities and a very rich and varied local history. Charlotte, NC combines all the characteristics that we all look for to live, excellent education, large job market and good salaries, low taxes, affordable housing, nice climate and it is also a beautiful city with many places for enjoyment, which is why it’s understandable that each day more and more people are moving to Charlotte looking for a better quality of life.